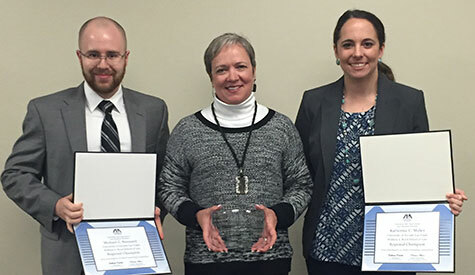 The Boyd team (left to right) of student Michael Stannard, coach and Saltman Center for Conflict Resolution Graduate Fellow Jae Barrick, and student Katherine Maher receive their awards for winning the ABA Regional Competition. The team went on to represent Boyd at the ABA National Client Counseling Competition April 1-2 at Baylor Law School in Waco, Texas. 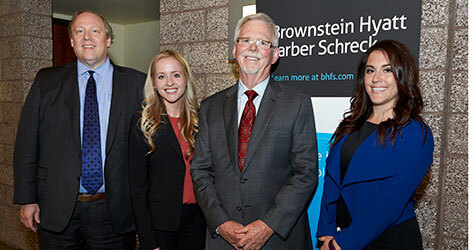 The UNLV William S. Boyd School of Law’s Society of Advocates (SOA) successfully tackled a full caseload this past weekend: The student organization participated in three competitions across the country and even organized one of its own here at home. 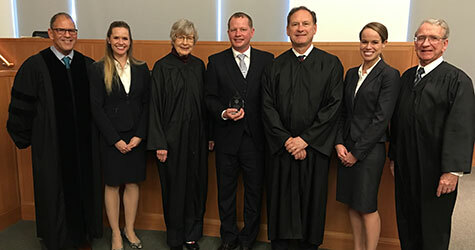 At Fordham University School of Law in New York City, two Boyd SOA teams competed in the Irving R. Kaufman Memorial Securities Law Moot Court Competition. Congratulations to Professor Lori Johnson and her student team of Erik Foley, Emily Haws, and Hayley Miller on winning second place in the competition, and to Professor Jeanne Price and her student team of Adrienne Brantley and Michael Matzke for their outstanding performance. what was the law school’s first appearance at the competition. In Waco, Texas, the Boyd student team of Katherine “KC” Maher and Michael Stannard performed well in the American Bar Association (ABA) National Client Counseling Competition held at Baylor Law School. The duo, who advanced after winning the ABA Regional Client Counseling Competition here at Boyd, was coached by Saltman Center for Conflict Resolution Graduate Fellow Jae Barrick '13. Lancaster; Boyd's Real Estate Law Society VP of Events Adam Ellis; Professor Tom McAffee; Lawyering Process Professors Linda Berger, Sara Gordon, Lori Johnson, and Rebecca Scharf; and Boyd alumni, faculty, and staff. The SOA is an honorary, co-curricular student organization that seeks to foster superior written and oral advocacy, as well as counseling and dispute resolution skills. Members hone these skills by competing in interscholastic advocacy competitions all over the country.